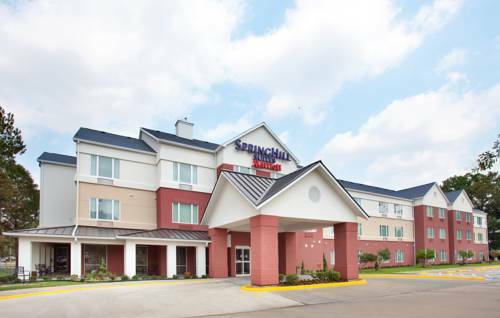 Book your next stay in Houston, TX at the SpringHill Suites Houston Brookhollow. We offer a host of excellent hotel amenities to keep you connected and productive here in northwest Houston. Enjoy free high-speed Internet access throughout the hotel, and wake up every morning to a complimentary hot breakfast buffet. All of our suites offer separate working, sleeping, and eating areas. Rooms also feature a flat-screen LCD TV, as well as a microwave and mini-refrigerator, to satisfy Texas-sized cravings, any time of day. Take a dip in our indoor pool, or challenge yourself with a workout in the 24-hour fitness center. Perhaps best of all, our hotel location in the NW Houston Brookhollow area offers easy access to all of the best parts of the city including downtown, the Museum District, shopping at the Galleria, events at NRG Stadium, a visit to the Houston Zoo & more. Experience a Texas stay today at the SpringHill Suites Houston Brookhollow.